A UX project plan is your blueprint for how you’re going to conduct UX activities. Not to be confused with the overall project plan (which is usually owned by a project manager or program manager), a UX project plan helps you think about how UX work will integrate with the broader project timeline. Sometimes, the work that you’re asked to do as a UX team of one doesn’t warrant a full-blown plan. Fix a Web page. Do a heuristic assessment. Such activities may just take a day or two. However, if your involvement is likely to span more than a few weeks, a plan is important. A UX project plan can take many forms. Even a simple table works nicely. Mainly, a UX project plan forces you to be honest with yourself about how you are going to tackle the work. This can be especially helpful if you are not really sure how you’re going to tackle work—which, let’s face it, happens every now and again. Sitting down to craft a plan helps you figure out what your process should be. 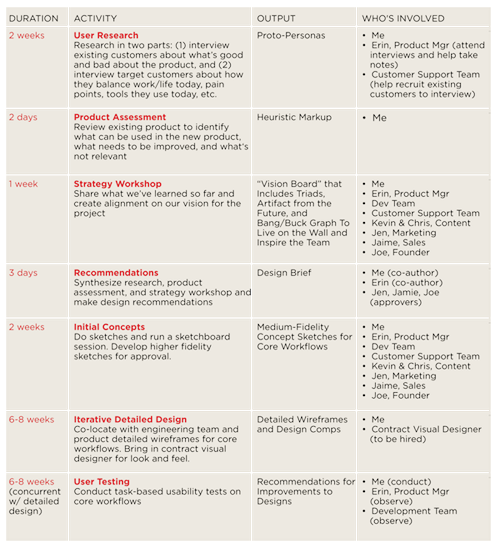 Even if no one has directly asked you for a UX project plan, it’s probably a good idea to put one together. There may come a time in the project when someone does ask you. When they do, you’ll be ready. Because UX processes are sometimes unfamiliar and new, your non-UX colleagues may not know what to expect as far as a process or deliverables. A clear and jargon-free UX plan can help set their expectations. It’s even better if you can include work samples. If you don’t have examples from your own portfolio yet, borrowing examples from books or online works, too. What’s your best tip for creating accurate UX project plans? Post your reply as a comment below by Tuesday, 10/22, midnight PT. The best reply wins a free copy of The User Experience Team of One. My trick on creating accurate UX project plans is to check them every morning. That way you can both be aware of what everyone is doing and when, and to adjust if necessary. The most important part of planning is to do it being aware that projects are dynamic processes that might change in time, so oftentimes realigning is the best way to stay in track and be accurate. It is interesting that the word “plan” comes from planum: latin for “level ground” and from ‘plantare: latin for “to plant” (i.e. a seed), both of which represent the first stage of a growing, evolving process. Thanks Victor for the thoughtful (and educational) reply. Smart thoughts on the importance of realigning and expecting a dynamic process. And the daily re-plan is like a daily scrum with yourself. Clever. One thing I like to do in my project space is setup a corner of a whiteboard with two little lists, one for “this week” and one for “next week.” That’s where I keep track of everything that matters most now, and then next. Your daily check in reminded me of that, but on a weekly basis. For your smart reply, you will win a free copy of The User Experience Team of One. Congratulations! (We’ll send you a separate note to figure out where to send it.) Thanks again! How funny. I’ve done lots of small projects since changing careers to UI/UX design expert. But recently was assigned a fairly substantial project and have done steps 1 – 6 in order to get to development. Although I think the time frames can be shortened depending on the project. And, I plan to do step 7 but with Axure prototypes, before actual development is done. That way major problems can be addressed prior to lots of development already being done.